When kids eat salad, they enjoy a world of flavor and nutrition possibilities that can be varied endlessly. What's more, if you have kids who are salad-eaters, it's easy to make simple salads for them and add extra ingredients to the salads for the adults in the family. Two-, three- or four-ingredient salads are perfect for kids, especially kids who are picky eaters. And every ingredient should be something the kids already like. For example, try a salad of romaine lettuce, grated cheese and ranch dressing. Or, if you have carrot-lovers, try a carrot salad made of shredded carrots and apples in a cinnamon mayonnaise dressing. Over time, as your kids develop a taste for more fruits and vegetables, you can add more ingredients to your salad recipes. Let go of nutritional perfectionism. The first salads your kids may eat might not be the ideal nutritionally-balanced meal. They might be heavy on the fat and/or calories and light on dark leafy greens and vegetables. That's okay. The goal here is to raise a lifelong salad-lover. Just as you don't expect a 5-year-old to learn to swim in the deep end, you wouldn't expect a 5-year-old to eat a radicchio salad with olive vinaigrette. Start the kids off with something they like - iceberg or romaine lettuce with ranch dressing or blue cheese dressing usually works well for kids - and gradually, expose them to new flavors over time. Include kid-pleasing ingredients in every salad. Salads don't have to be lettuce, tomatoes and cucumbers. My favorite kids salad recipe is just lettuce, parmesan cheese and Goldfish crackers. When kids see something familiar, like Goldfish crackers, in a salad, they want to try it (especially if that something is a little unexpected). Other great kid-friendly salad ingredients include bacon, cheese, fried onions (like the kind you'd put on a green bean casserole), fruit and pasta. My broccoli bacon salad recipe is a real kid-pleaser, because it not only has lots of bacon, it's also made with grapes and peanuts in a sweet mayonnaise-based dressing. Let the kids make their own salads. Creating a simple salad bar for the family once a week not only makes the prospect of eating salad more fun to kids, it also allows everyone in the family to eat what their like. A home salad bar is a great way to help kids expand their salad preferences, too. You might serve a simple Caesar salad to a 7-year-old every night for two months. But if you have carrots on your salad bar, and she likes them, she'll likely add that to the salad if she can make the choice on her own. What's more, she may be more willing to try new ingredients if she can add just a bit to a salad she creates herself. Green Salad with Apples and Nuts - Lettuce, apples, hazelnuts and cheese make this salad appealing to both kids and adults. Ramen Noodle Cole Slaw Recipe - The sweet-salty combination of flavors is always a hit with the kids. And they'll also like the crunchy noodles and peanuts in this popular cole slaw recipe. 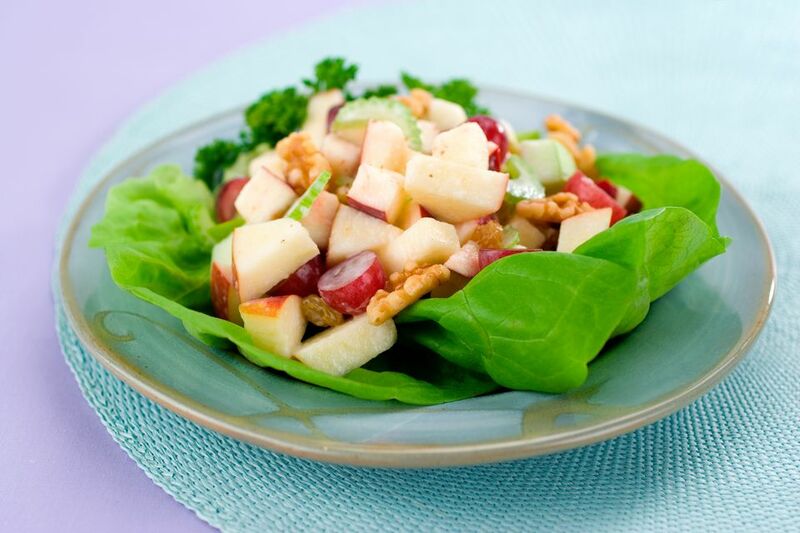 Waldorf Salad Recipe - Sweet apples and raisins and crunchy celery and walnuts are an appealing combination for both kids and adults in this tasty salad recipe. Wedge Salad Recipe - This classic salad is simply a mixture of lettuce, bacon, tomatoes and blue cheese in a creamy dressing. Yes, You Can Pop Wild Rice!